Firefighters are here to protect us. They save our lives, they save our belongings and they save our loved ones. They’re used to stress. Firefighters can make any number of critical rescues during a career, but how many times do we hear about emergencies at the firehouse? Last week, a Salisbury Fire Department had an emergency of its own. Lieutenant Tim Oliveria was changing the oil of a departmental SUV when the jack failed, dropping the vehicle on top of his chest. Firefighters quickly began the laborious task of extricating one of their own from the potentially fatal work accident in Massachusetts. Our Massachusetts injury lawyers thoughts and prayers are with the firefighter as the oil-change accident caused some serious internal injuries. His ribs are broken and the stress from the accident was followed by a serious heart attack, according to Boston.com. When firefighters were able to finally free the Lieutenant, they noticed that he had no pulse. They were unable to resuscitate him at the scene. An American Medical Response ambulance crew arrived and took him to Anna Jaques Hospital in Newburyport. He was later airlifted to Beth Israel Deaconess Medical Center. His condition was listed as critical as of Monday. “Our thoughts and prayers are with his family, and we hope that Lieutenant Oliveria has a full recovery,” said Edward Kelly, president of the state fire union. According to firefighter polls regarding their sources of stress and worry on the job, injury or death to other firefighters continue to be at the top of the list. Surprisingly, injury to themselves remains at the bottom of the list. “It’s been devastating. Guys have that 1,000-yard stare on, because it’s Timmy,” LeSage said. As per standard procedure, Merrimac, Newburyport, and Amesbury covered the Salisbury firehouse. “It is very important. It is extremely important that these guys be able to clear their heads and minds of the incident before they come back to work,” said Merrimac Fire Chief Ralph Spencer, who spent part of Friday working in Salisbury. 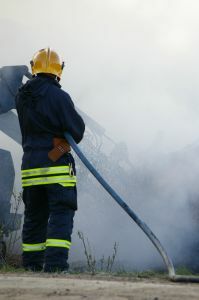 According to the National Fire Protection Association, nearly 30 firefighters lost their lives on the job in 2010. During that same year, the median age range of firefighters who lost their lives on the job averaged 52.5-years-old. If you have been injured at work in the Boston area, contact Massachusetts Workers’ Compensation Attorney Jeffrey S. Glassman for a free and confidential appointment to discuss your rights. Call 1-877-617-5333.